​Los Angeles Rams' head coach ​Sean McVay was the ​youngest head coach to ever lead a squad in a Super Bowl, but despite his outstanding season, the 32-year-old coach was handed a humbling defeat at the hands of the ​New England Patriots Sunday evening. The Rams' offense was stifled by the Patriots' defense, and McVay simply had no answers for the Patriots' relentless pressure, as the Rams failed to record a single touchdown. After the game, McVay discussed his emotions. ​​"I'm pretty numb right now. I definitely got out-coached," said McVay, admitting what he felt he had to. He shouldn't feel too bad about being out-coached by the man who is known as the greatest NFL coach in history. ​Belichick has the most Super Bowl victories of any coach and ​McVay competed honorably against his counterpart in many ways, especially on the defensive side of the ball. What Belichick represents in the NFL is the old coach whose legacy will last forever. McVay is the up-and-coming coach looking to cement his status as one of the brightest young minds in the league, and Sunday night, the victory went to experience. 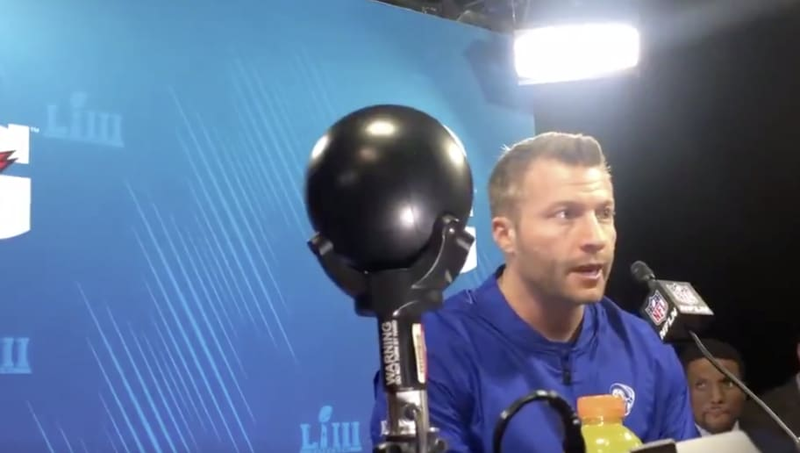 While McVay was unsuccessful in his first trip to the Super Bowl, the Rams' head coach will likely make more appearances in the league's biggest game throughout his coaching career. No sweat. We just move on.